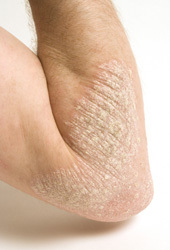 Psoriasis is a persistent, inflammatory skin condition. Some cases of psoriasis are so mild that people don’t know they have it. Alternatively, severe psoriasis may cover large areas of the body. Dermatologists can help even the most severe cases. Psoriasis is not contagious, so it cannot be passed from one person to another. Psoriasis, does, however, have a tendency to run in families. The cause of psoriasis is unknown but research indicates that the immune system plays a key role. Psoriasis can be triggered by stress, infection such as strep throat, and by taking certain medicines. Lack of sunlight and cold dry weather can also cause psoriasis. There are five different types of psoriasis (plaque, guttate, pustular, inverse, erythrodermic). Treatment: While psoriasis cannot be cured, a number of treatment options can help control psoriasis. A person’s health, age, lifestyle and the severity of the psoriasis determine which treatment options are appropriate. Some treatments include topical medication, UV light therapy, systemic therapies and biologic agents. Please contact our staff to make an appointment if you have psoriasis.